When you rent a car to drive from McCarren Airport in Las Vegas to drive to near by hotel or destination, you must have some basic knowledge of the local driving directions and rules. Driving directions for Las Vegas from McCarren international Airport includes taking Swenson St North, then left turn on E Tropicana Ave and a right on Las Vegas boulevard S or the Strip. By car, it takes around 8 minutes to reach from the McCarren International Airport to Las Vegas city. Las Vegas airport is situated around 3.4 miles from the city and a car hire is the fastest and most convenient way of traveling to the city, from the airport. Like any other city, Las Vegas has its own driving rules that must be followed when driving a rented car from the airport to anywhere in the city. Make sure you have all the papers with you including license, registration and car hire permit. Seat belts and shoulder harness are important. Stop at all the traffic signals that will come on your way from McCarren Airport to Las Vegas city or on another street you are driving on. Do not drive recklessly or under influence of alcohol. 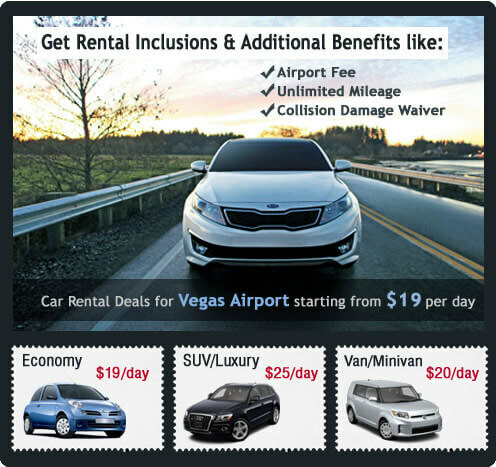 Vegasairportcarrental.com is a provider of affordable car hire deals for travelers looking forward to rent a car at Vegas Airport (McCarren International Airport). We have a car rental desk at the Vegas Airport for easy pick up facility straight from the airport. When arriving at this airport, you can save your time by booking in advance with us and we will have your chosen vehicle ready for you to pick after landing. We offer you easy online booking along with cheapest prices to suit your pocket.